NEW YORK -- For the first time ever, one billion people used Facebook in a single day. 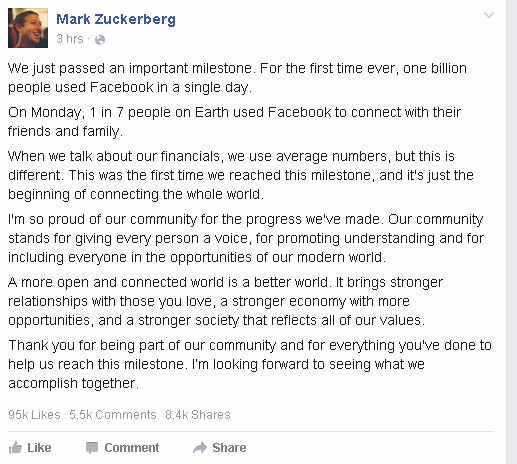 The announcement was made by company CEO Mark Zuckerberg, who said the milestone was reached Monday. He said 1 in 7 people on Earth were on the social networking site that day to connect with their friends and family. In a statement on Facebook, Zuckerberg said, "I'm so proud of our community for the progress we've made. Our community stands for giving every person a voice, for promoting understanding and for including everyone in the opportunities of our modern world." The 1 billion figure is different from the daily user numbers Facebook discloses each quarter when it reports its financial results. Those are the average number of daily users, counted over a 30-day period. 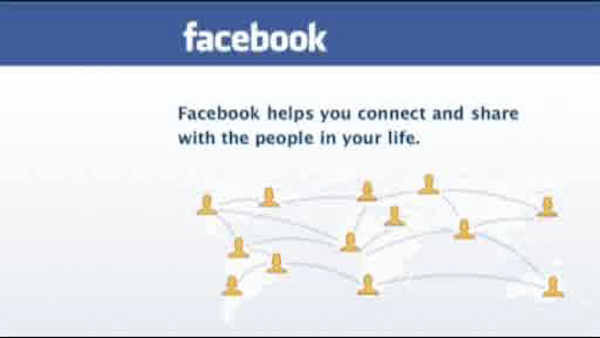 Facebook had 968 million daily active users in June. Overall, Facebook has nearly 1.5 billion users who log in at least once a month. It hit the 1 billion user milestone in October 2012. Most people on Facebook live outside the U.S. and Canada.